Pour plus de 2000 ans, le vin et le paysage façonnent les gens sur la Moselle. Chaque époque a laissé son empreinte, l'Empire romain, les monastères puissants, la Révolution française. Tout cela se déroule sur la Moselle le long d'un paysage culturel unique. Notre vignoble (depuis 1337) est situé dans le célèbre village viticole Piesport. Vous vivez dans une belle vieille ferme, juste entre vignes et la Moselle. Notre appartement 4 étoiles est très bien équipé et vous propose un séjour de détente. Profitez de notre jardin méditerranéen pour se détendre et se relaxer. Faits saillants autour de: De notre domaine, vous pouvez facilement atteindre les impressionnants lacs de cratère volcanique de l'Eifel (35 km), les châteaux romantiques et villes du vin avec ses maisons à colombages sur la Moselle (Bernkastel-Kues 20 km), ou les constructions monumentales romaines imposantes (Porta Nigra, l'amphithéâtre , thermes) à Trèves (35 km). Vous pouvez également visiter nos voisins dans le Grand-Duché de Luxembourg. Faits saillants autour de: De notre maison, vous pouvez facilement atteindre les impressionnants lacs de cratère volcanique de l'Eifel (35 km), les châteaux romantiques et villes du vin avec ses maisons à colombages sur la Moselle (Bernkastel-Kues 20 km), ou les constructions monumentales romaines imposantes (Porta Nigra, l'amphithéâtre , thermes) à Trèves (35 km). Vous pouvez également visiter nos voisins dans le Grand-Duché de Luxembourg. La capitale du Luxembourg avec ses restaurants gastronomiques et de rencontrer une touche française peut être atteint en moins d'une heure en voiture. D'Avril à Novembre vous pourrez découvrir dans les festivals de vin Moselle hospitalité. Musique et théâtre festivals offrent en plus culturelles. Nos excellents vélo et de randonnée relient une variété de destinations attrayantes ensemble. Die Wohnung ist sehr gemütlich und es ist alles vorhanden, was man so braucht. Wir haben uns sofort wohlgefühlt. Die Lage und die Aussicht sind traumhaft. Für den schönen Garten war's noch zu früh im Jahr. Die Gastgeber sind sehr sympathisch und der Willkommensgruß war lecker. Vielen Dank nochmals. Wir kommen gerne wieder. Angelika. K. und Gerhard K.
Zeer geslaagd voor een korte vakantie. Prachtige omgeving, temidden van de wijngaarden aan de moezel. Appartement is niets op aan te merken. Let wel, het apartement is boven, dus je moet met de trap er naar toe. Wohnung hat alles was man braucht, gute Aufteilung und ausreichend Platz. Rasen mit Möbeln vor dem Haus lädt zum Entspannen ein. Sehr aufmerksame Gastgeber. Net en ruim appartement op een mooie locatie aan de Moezel, van waar uit je leuke uitstapjes kunt maken. De verhuurders zijn heel gastvrije. It's rare I write reviews but after enjoying a delightful stay I felt compelled to comment. Firstly us: we are a family of 4 including 2 children boy/girl aged 8/7. We stayed 5 nights in the week leading up to Easter. I am familiar with the region but last visited nearly 20 years ago. We chose Piesport because of its geographic location to the areas we wanted to visit whilst staying (Burg Eltz/Cochem to the north and Trier to the south, not to mention the delightful Bernkastel-Kues 15Km up the road). 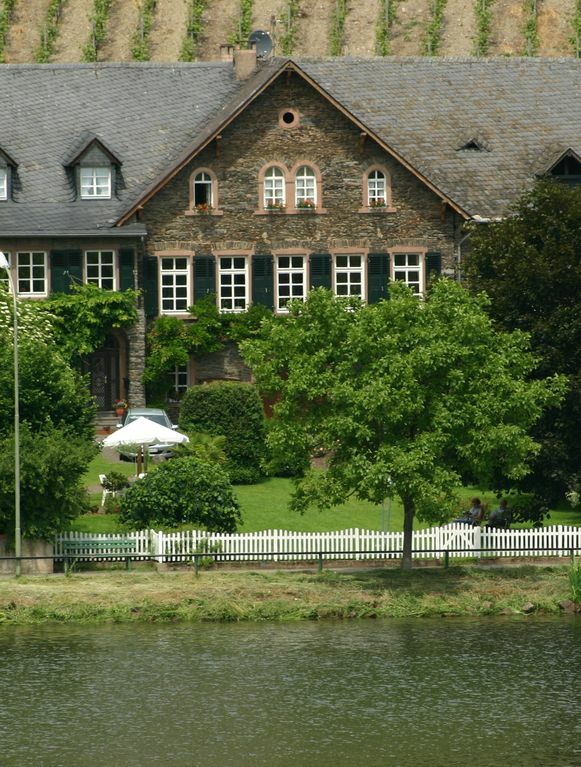 We found Piesport to be a charming, family friendly and authentic German wine town. It has lots of character and plenty of places to eat and drink, with the locals all seeming friendly and hospitable. It has easy access to cycle paths that head in both directions along the river and even some designated walking routes. There is a substantial supermarket, open Mon - Sat until 8pm that stocks plenty of fresh and tinned produce as well as an adjacent drink and convenience store. Everything is (as it should be) in German and on the occasions my woeful attempt at speaking the language was inadequate the locals seemed happy to slip into English to overcome confusion. The apartment is on the edge of town but this only adds to the charm with there being plenty of facilities less than a 10 min walk from the property. Elfriede was extremely friendly upon our arrival and we felt nothing was too much trouble for her. We certainly appreciated the complimentary bottle of local wine and jam as well as the Easter chocolate for the kids at the end of our stay! The property was very clean with plenty of towels provided. There are 2 good size bedrooms with lots of storage and the main bedroom has a stunning view of the large front garden and river. The main lounge/diner is a decent size equipped with TV and CD player /radio and plenty of plug sockets. The kitchen is small but well equipped. The bathroom is large with a fantastic shower. There is also a designated off road parking slot (for 1 car) directly in front of the main door. The only thing some people with very small children need to be wary of is the steep spiral staircase that leads to apartment from the ground floor. If you are lugging push chairs or other large equipment around regularly on your own it may be a tad tricky. Overall Piesport is charming and beautiful not to mention a great spot. The apartment is spacious, clean and has great views. For families or couples alike it is highly recommended!